I am back from the Land of the Mid Night Sun. 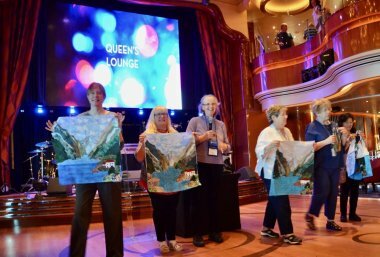 This was one of the best quilting cruises yet. The Norwegian fjords were spectacular and the students and workshops a blast. 1. Student party. 2. Intrepid Quilting cruise Director Kim and teachers Sue Nickels and Kathy. Paula Nadelstern was with us too. 3. 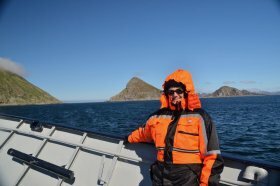 Me in my full on Arctic suit on the hunt for Puffin photos. 4. 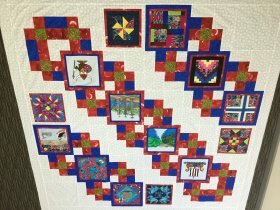 Beth Laugesen won the challenge blocks and already made this fabulous quilt!! 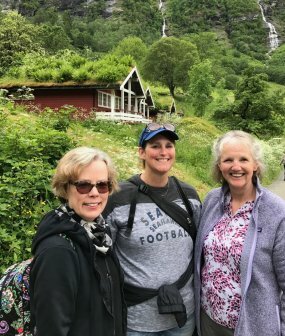 Quilting cruises are a dream vacation and those of us lucky enough to go on one are extremely grateful. It is a great way to travel if you are a single quilter or your spouse is not interested in traveling. Amy will match you with a roommate, and you will have built in friends to go on adventures with. Husbands and family are welcome and join in the many festivities too. I went above the Arctic Circle this time. Next year, it would be awesome if you can come with me to Tahiti and the Marquesa Islands. The Paul Gauguin is a small boat (300), so we can get into all the small bays. It is all inclusive including drinks, tips and all the recreational equipment you could possibly need. 2018 August, but don't let that scare you. The temperatures year round are much like Hawaii because you are sitting in the middle of the ocean. Click to find out more www.quiltcruises.com. Nordic Adventures was the Project we worked on. After posting it on Facebook, many of you wanted me to release the pattern for everyone. It is available in my web store now. The bottom Rosemaling panel is hung with Norwegian sweater clasps but can just be attached to the quilt top. Glue Sticks - It's hot out there. Remember to place a damp foam makeup pad in a cup while working to glue up and turn your edges. Place glue stick upside down on the pad. You can zoom along and turn a bunch of prepared pieces and the glue won't dry as quickly in the heat. Balance - next month I want to talk about balanced compositions. Visual balance of colors, textures, and shapes all lend to dynamic designs. Send me a photo of a project that you want me to give you feedback on for balance, I may use it as an example in next month's newsletter. "Language of Flowers" and "Enso" both came home with ribbons from the Minnesota Quilters Show. 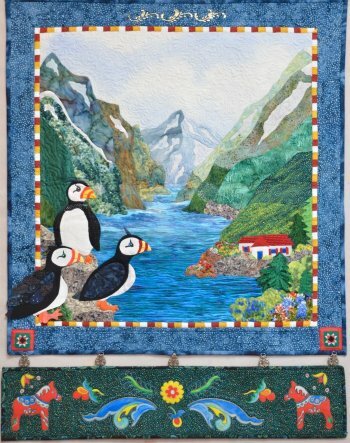 I will be teaching there next year and hope to have a workshop on the above pattern for all those Scandinavian quilters. 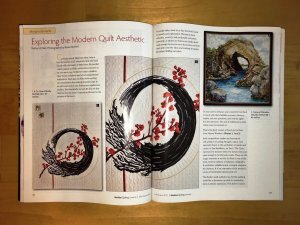 "Machine Quilters Unlimited" requested that I write an article about my courageous journey into Modern Quilting. See the Article in this months issue. Thank you Sandy Snow for sending the photo while I was in Norway. Houston calling. I always hold my breath on this one...... Both my Language of Flowers and my Celtic Fox will get to go. I still have some spaces in two of my workshops, plus I am doing a lecture. If you are coming, please take a workshop or say hi at the lecture. It is always a blessing to meet some of you in person. Written, documented Design permission required by most shows now. I Used Someone’s Design as Inspiration for My Quilt. Most quilters fall under this situation. If someone else’s work is identifiable in yours, you should ask for their permission. If it is not identifiable, it is still common courtesy to credit the artist and the work that provided the inspiration on your entry form. I Purchased my Pattern, Book, or Magazine. They sold the Patterns to be used. Doesn’t that Give me All the Permission I Require? Purchasing the pattern, book, or magazine simply gives you permission to make the quilt for your own use. To show it publicly, enter it into competition, or use it for commercial purposes, you must have the pattern designer's written permission. How do I obtain the Permission I Need? Check the inside cover pages of the book or magazine and the back of the pattern. You may find the contact information or the artist’s website information there. If the information is not printed there, contact the publisher and/or search for the artist’s website on the Internet.Begin with a short letter or email. Tell the artist that you have made a quilt from their pattern or artwork and attach a photo. Ask their permission to enter it for competition and to publish photographs with proper credit given. Depending on the situation, you may need the publisher’s permission as well. In my next newsletter I will tell you the exciting story of getting design permission from another artist/photographer for my new quilt. Have a wonderful and safe summer. You are all dear to me.